The Sigma 24-70mm F2.8 DG OS HSM Art lens offers a classic focal range and fast maximum aperture whilst delivering the goods in the image quality department. It's tack-sharp throughout most of the zoom range, particularly in the centre of the frame, with sharpness only falling off a little at f/2.8 when using 50-70mm. Otherwise the Sigma 24-70mm F2.8 DG OS HSM Art is certainly one sharp lens. It also produces some very nice bokeh effects thanks to the 9-blade iris diaphragm. There's a little vignetting at wide-open apertures, some barrel distortion at 24mm and pincushioning at 70mm, but overall the Sigma 24-70mm F2.8 DG OS HSM Art is the latest in a long line of recent high-performing Sigma lenses. Build quality is excellent, with the brass lens mount and sober all-black design adding to the high-quality feel, and Sigma have even generously included a very good lens hood and padded case. It is significantly heavier than its main rivals though. Focusing was very quick on the Canon EOS 5DS R that we tested the lens with, and manual focus over-ride at any time is a great feature, as is the effective built-in optical image stabilisation system, something that the Canon EF 24-70mm f/2.8L II USM lacks. As usual, the price of the Sigma 24-70mm F2.8 DG OS HSM Art is very attractive, significantly undercutting the rival lenses from Canon and Nikon. 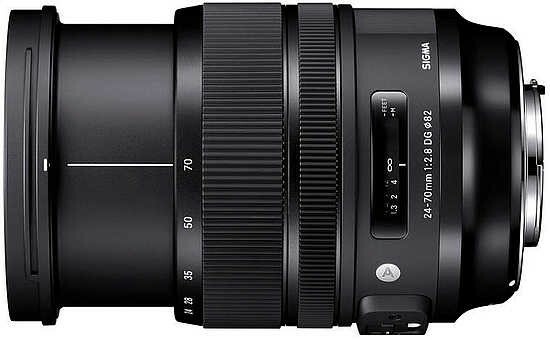 Overall, the new Sigma 24-70mm F2.8 DG OS HSM Art is a very well-built, fast standard zoom lens that delivers superb results on the latest high-resolution full-frame cameras.